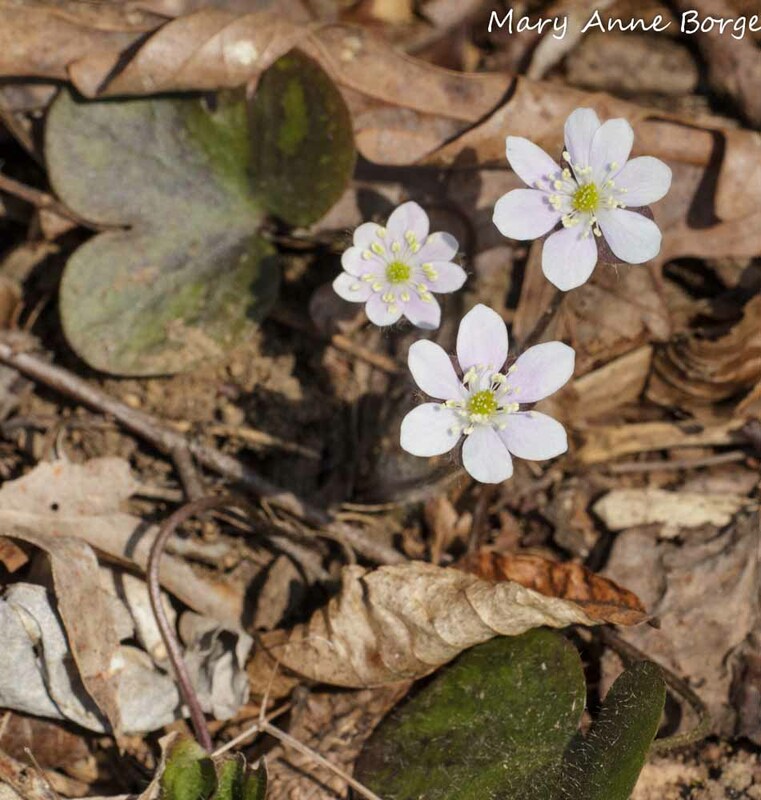 Insects and reptiles are waking up, birds are gathering nesting materials, and early wildflowers are covering the forest floor. Spring has finally arrived! Several friends mentioned seeing a dark butterfly with yellow or cream borders, wondering what it was. These early flying beauties are Mourning Cloaks. Antifreeze-like chemicals called glycerols in their blood enable Mourning Cloaks to survive the winter as adults, using loose bark, other crevices in trees, or a pile of branches to shelter from the elements. They are able to raise their body temperatures by shivering, enabling them to generate enough warmth to fly in cool temperatures. They often drink sap, but will also nectar at flowers. I have seen them feeding on Red Maple flowers (Acer rubrum). On a walk on one of our favorite trails in the Sourlands the other day, we saw two spiraling skyward together. 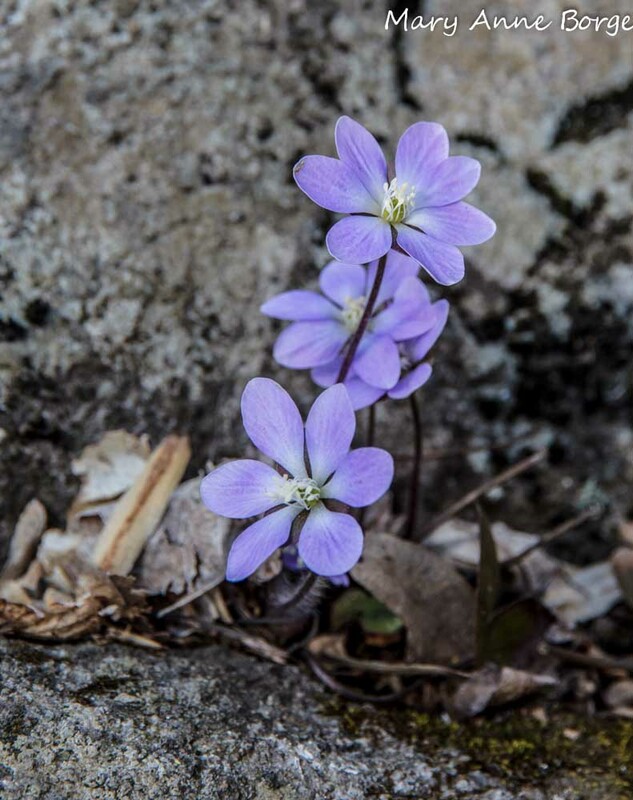 With the exception of a few summer-like days, the temperatures have been warm enough for flowers to emerge and bloom, but cool enough to preserve the blossoms for many days. 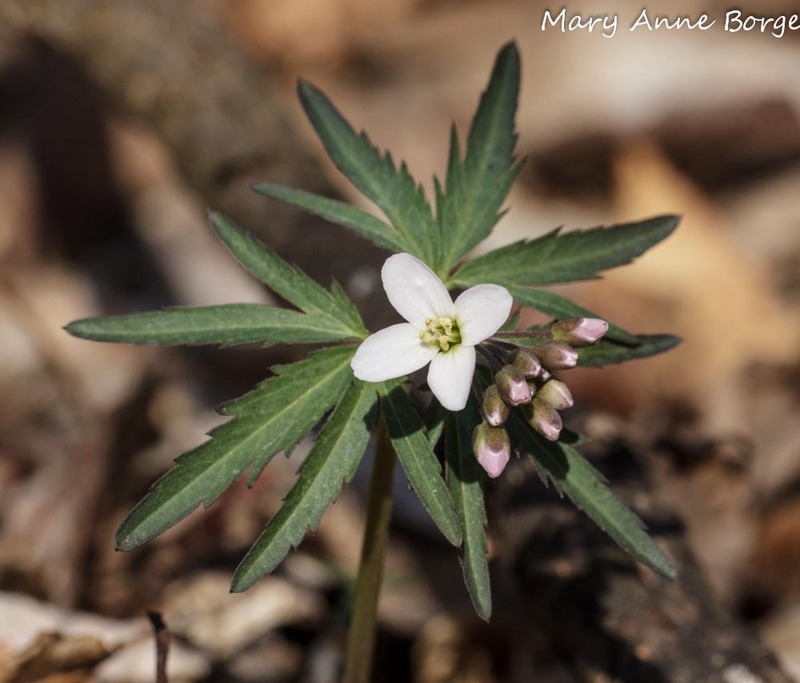 Early spring wildflowers flowers are gracing the trails and hillsides. 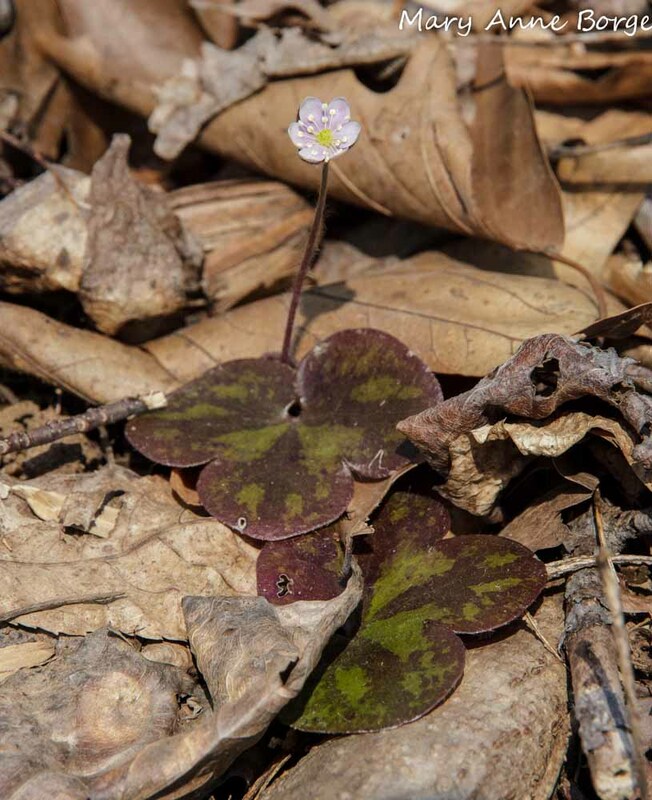 These delicate but tenacious plants manage to push their way through their winter blanket of fallen leaves, like this Spring Beauty (Claytonia virginica). 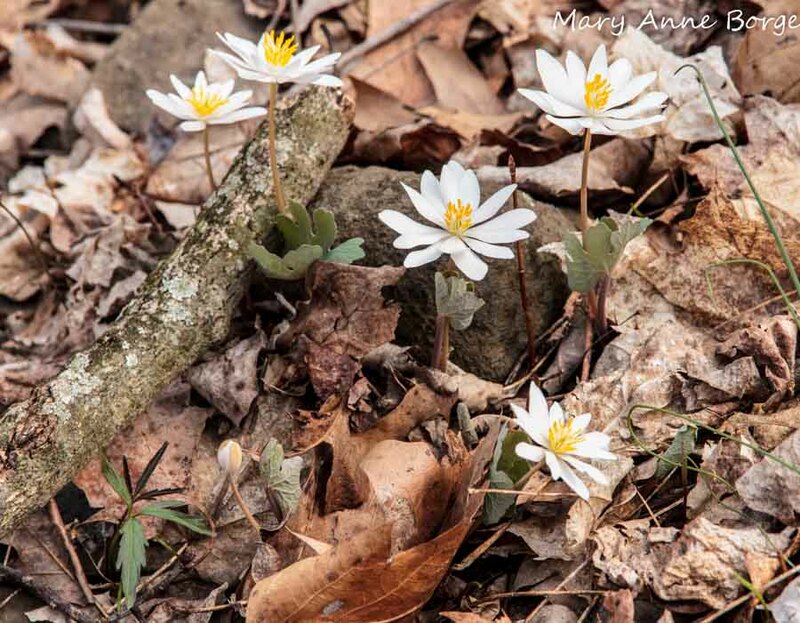 Bloodroot (Sanguinaria canadensis) carpeted the woodland floor over the past week or two. 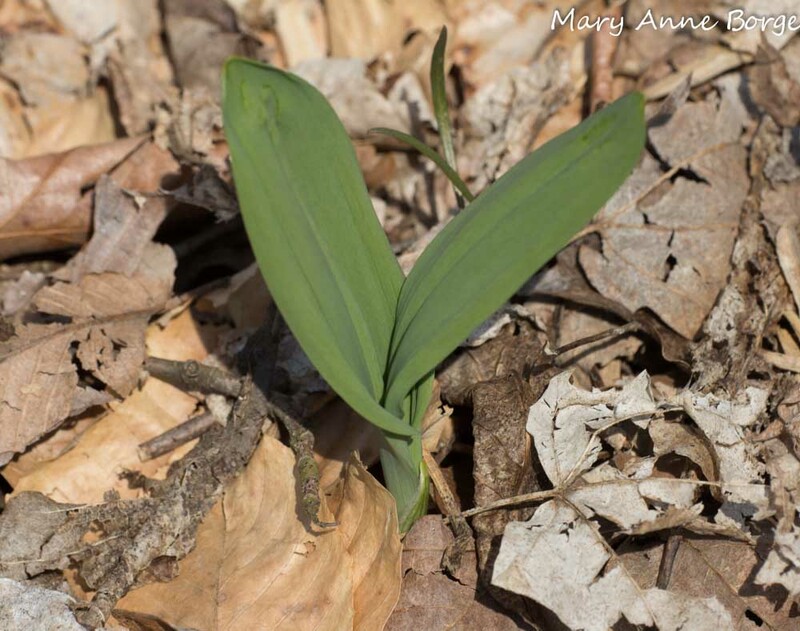 Wild Leek (Allium trioccum), also called Ramps, are gathering energy from the sun, preparing to produce their flowers many weeks from now. 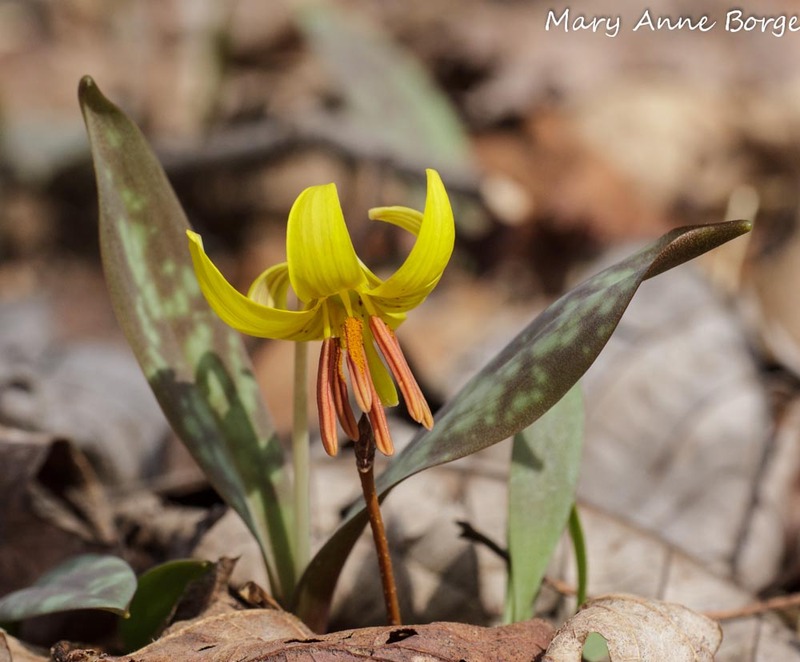 This lovely Trout Lily (Erythronium americanum) exuberantly flung out its leaves, welcoming the sun’s energy while beckoning potential pollinators with its brightly colored flowers. 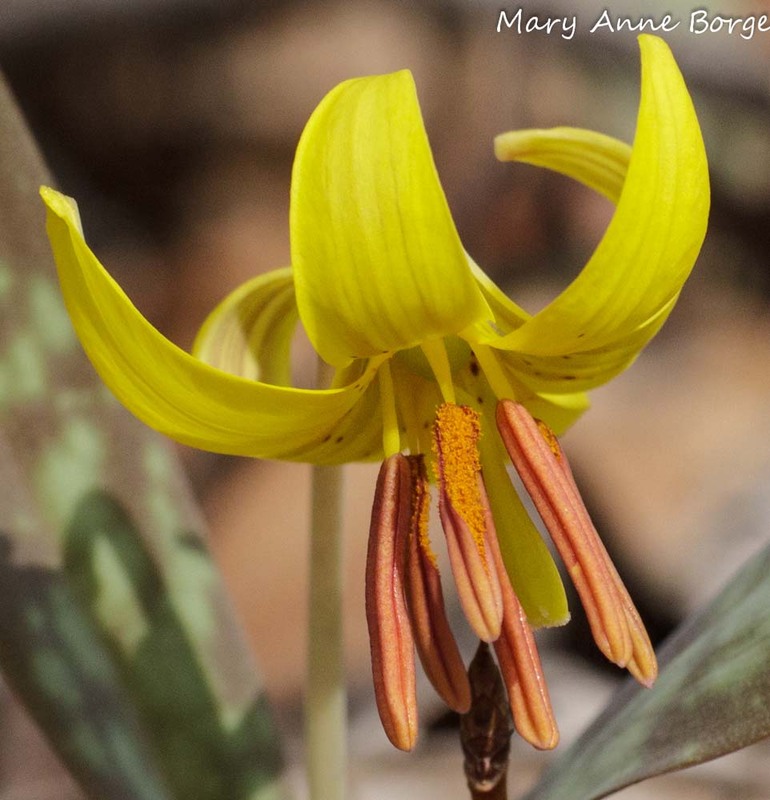 In order to protect their pollen from the elements, Trout Lily flowers face downward until they are pollinated, then they rise upright. To leverage its chances of reproductive success, another strategy Trout Lily employs is to open half of its anthers one day, offering the rest the next. 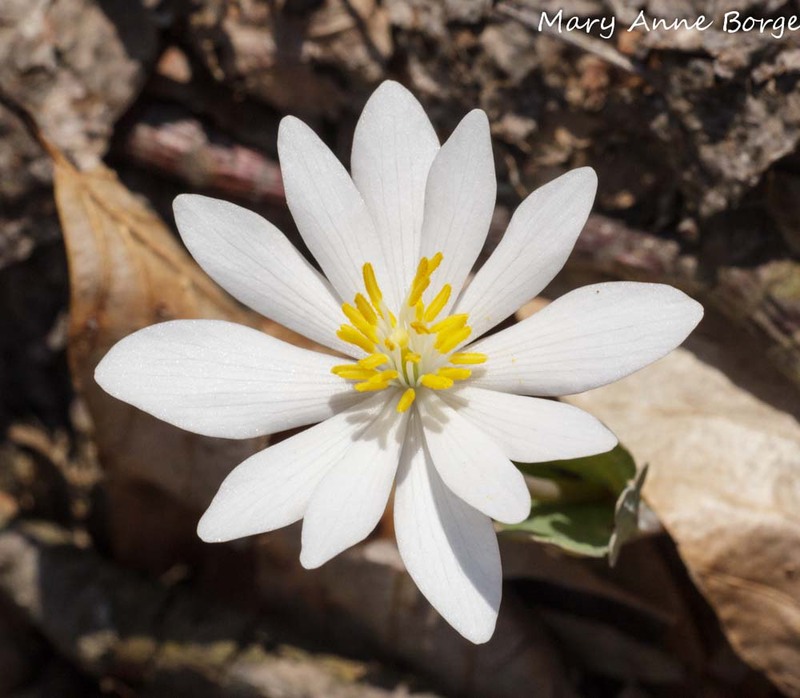 In the photo below, you can see three of the flower’s six anthers splitting open to release their pollen. 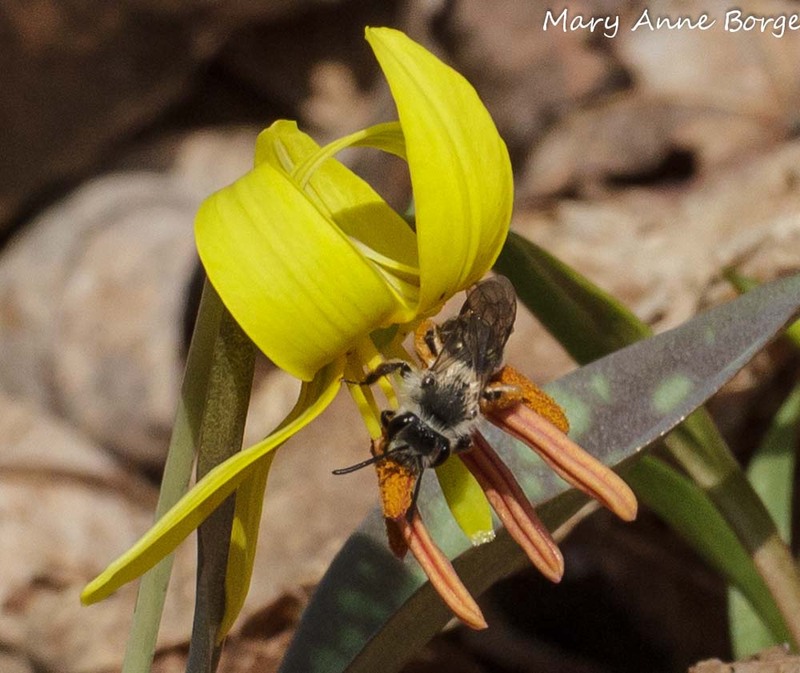 A Mining Bee, probably Andrena erythronii, is the pollinator visiting the Trout Lily below. The female members of this bee species collect pollen and nectar to feed their larvae, storing this food on the hairs (called scopae) on her upper rear legs until she can return with this bounty to provision her brood cells. 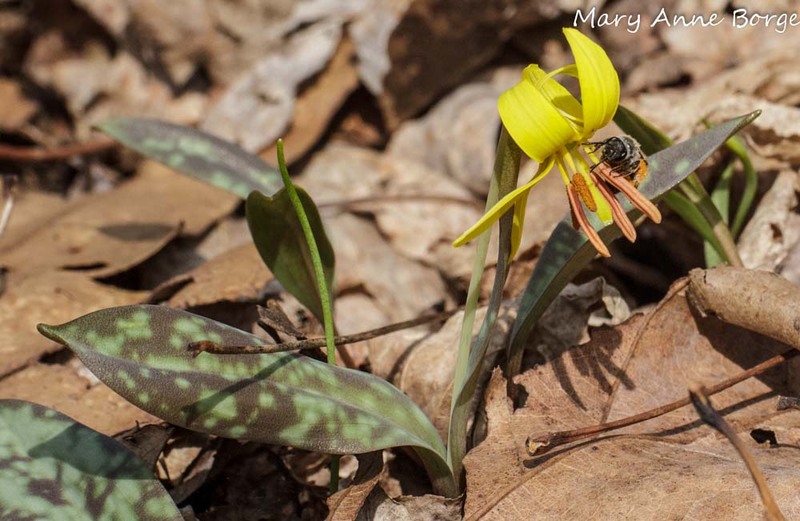 Andrena erythronii specializes on Trout Lilies, but it is able to use the pollen and nectar of other plants to feed its young if Trout Lilies are unavailable. Other critters are emerging from their winter slumbers. 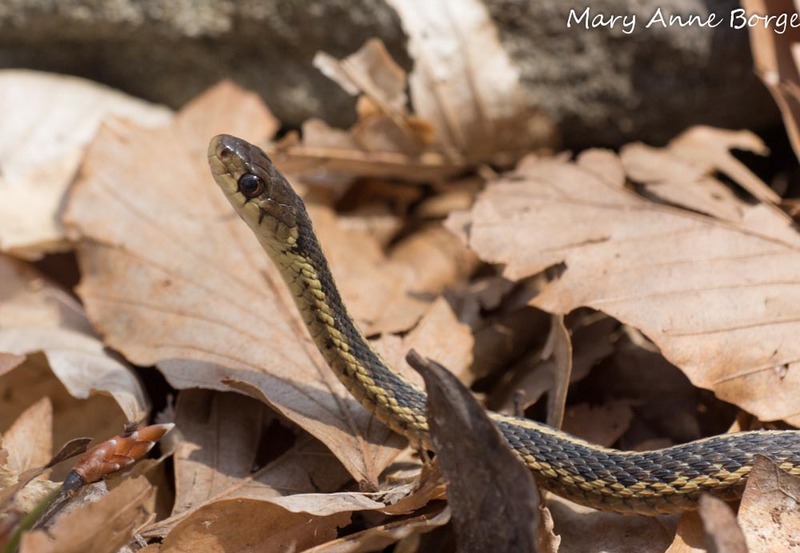 As I walked, I saw Garter Snakes basking in the sun. This one stood its ground as I carefully moved around it. 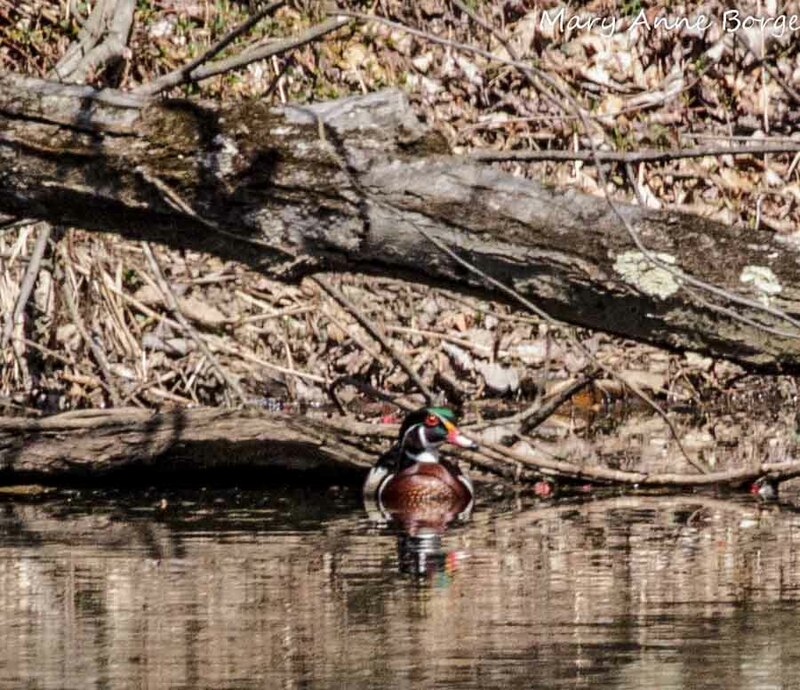 Wood Ducks hid in the shadows of a pond’s edge. 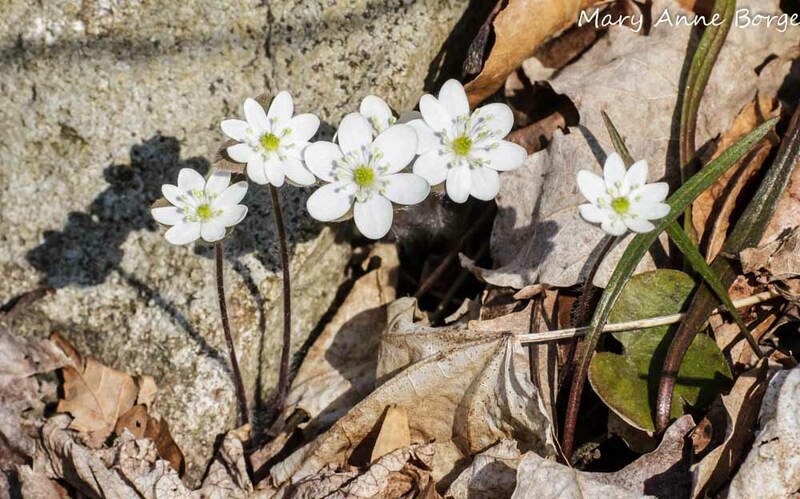 A special treat for me was seeing Round-lobed Hepatica (Hepatica Americana; synonym Anemone americana) growing from rock crevices and through leaf litter, in colors ranging from deep violet to pure white. 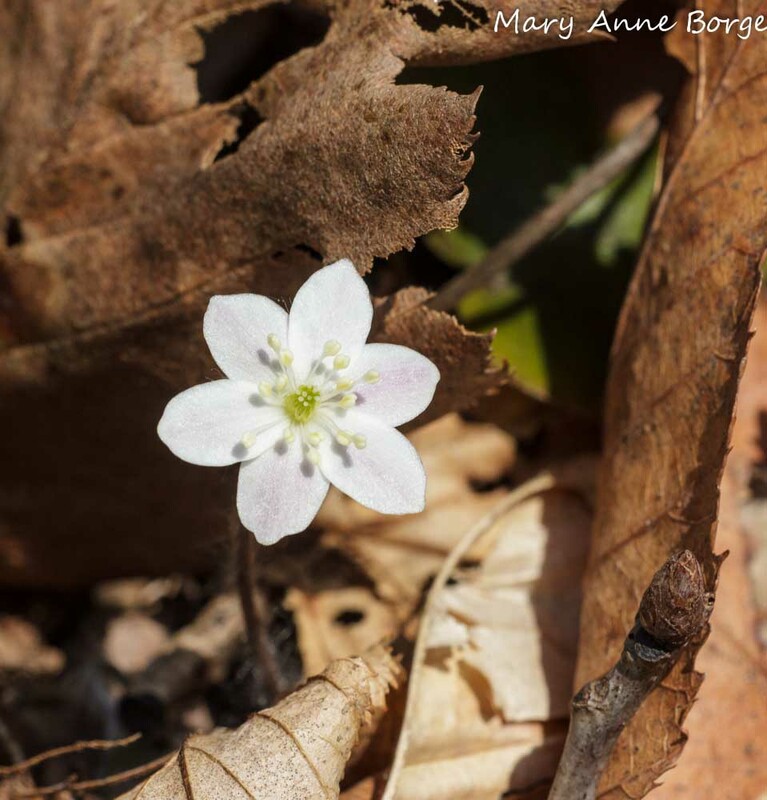 This entry was posted in Birds, Butterflies, Native Plants, Other Animals and tagged nature, Pollinators, Sourlands, spring ephemerals by Mary Anne Borge. Bookmark the permalink. 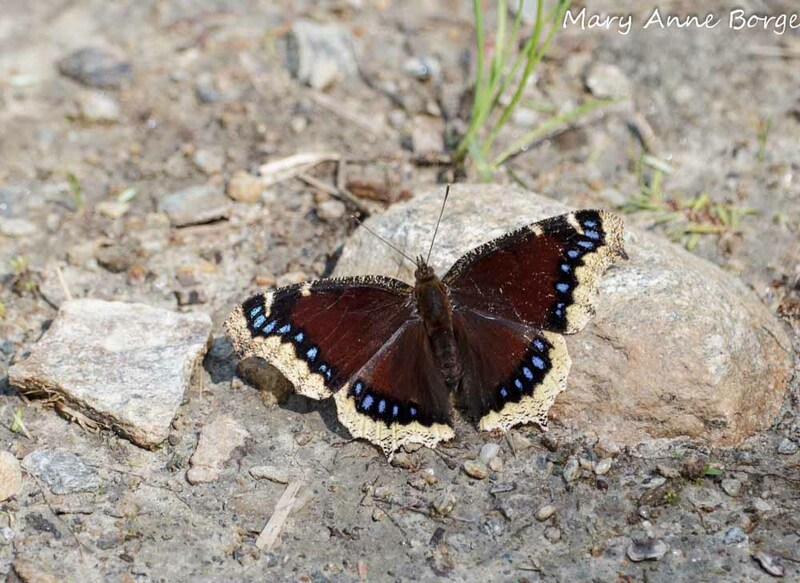 On April 13 on a tour with a group of girl scouts down by the old pond at Bowman’s Hill Wildflower Preserve, we saw a mourning cloak. It was a true gift of nature! Thanks for the interesting facts and wonderful photos. Thanks, Elaine. 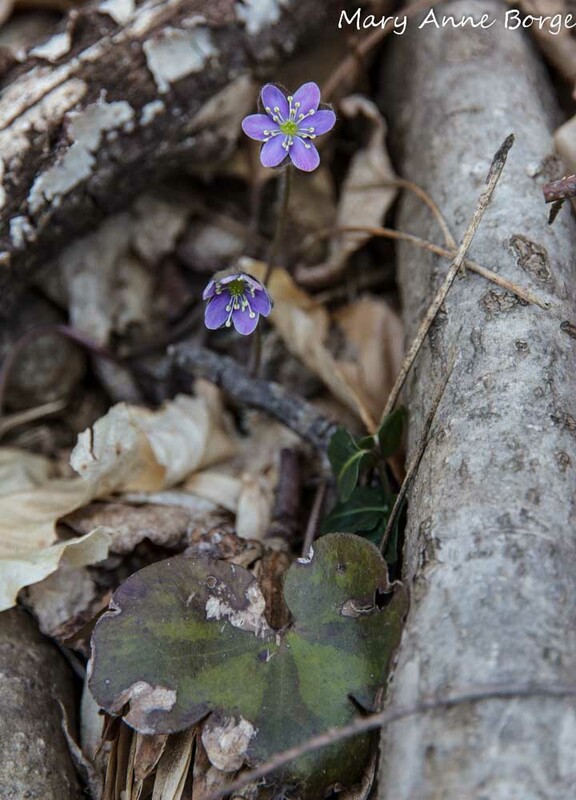 It seems like every walk in nature results in something delightful, and often new. 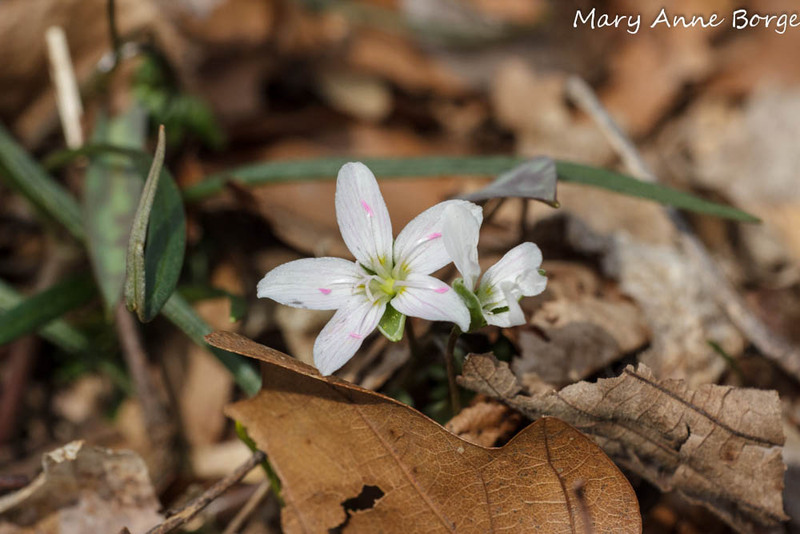 The flowers at Bowman’s Hill Wildflower Preserve are fabulous right now. 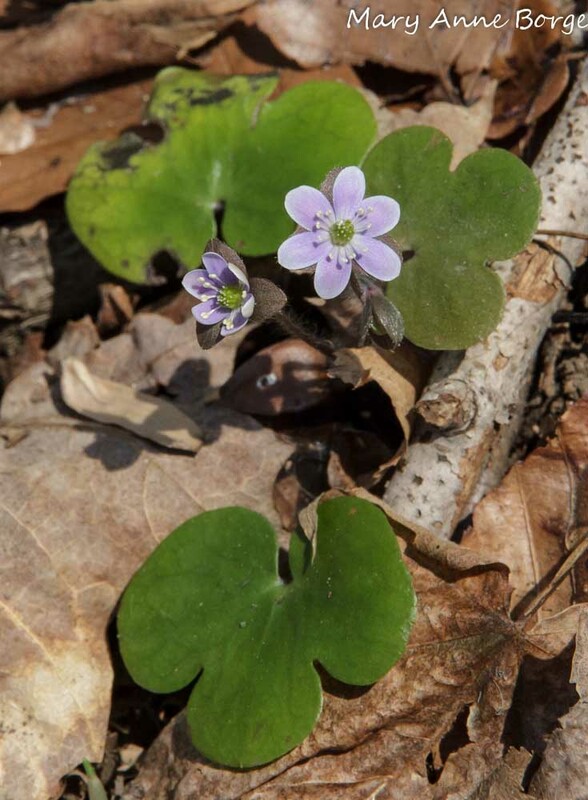 Bluebells, Wood Poppy, Dutchman’s Breeches, Marsh Marigold, Cut-leaved Toothwort, and many more are all in bloom. Don’t miss it! 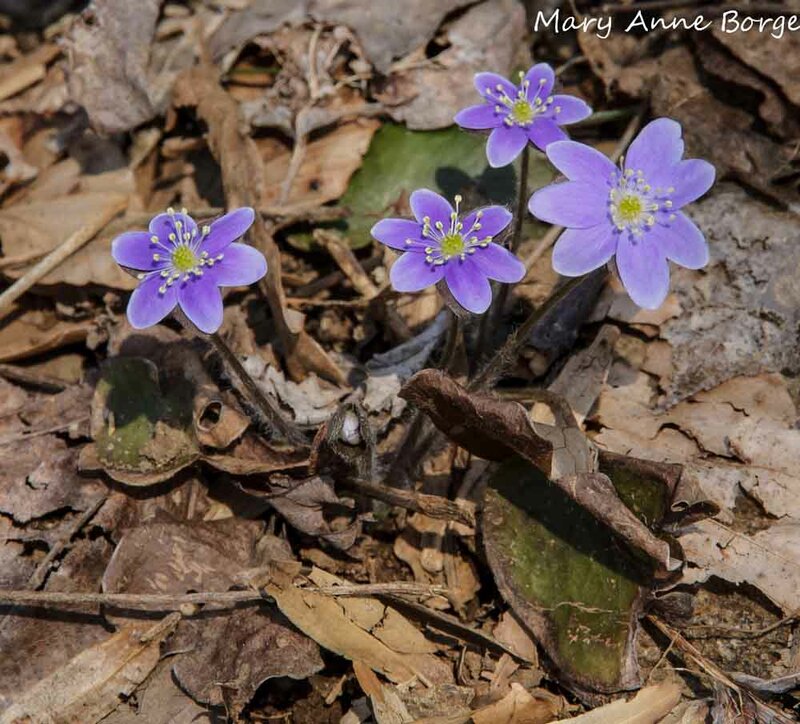 Wonderful as always Mary Anne. I didn’t know about the trout lily opening half its anthers. Thanks for the added natural history note for my cache! Love it. Thanks, Pam! That was new for me, too. 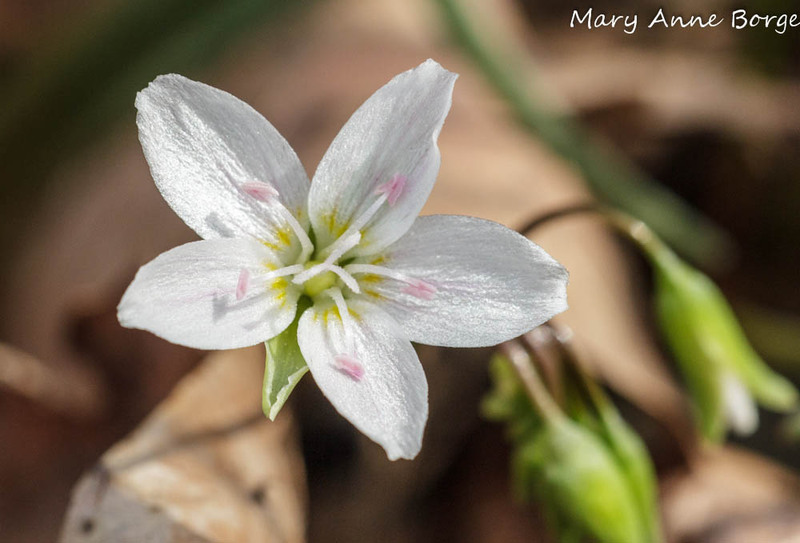 I noticed it when I was reviewing my photos, and then it was confirmed in Carol Gracie’s wonderful book, Spring Wildflowers of the Northeast. 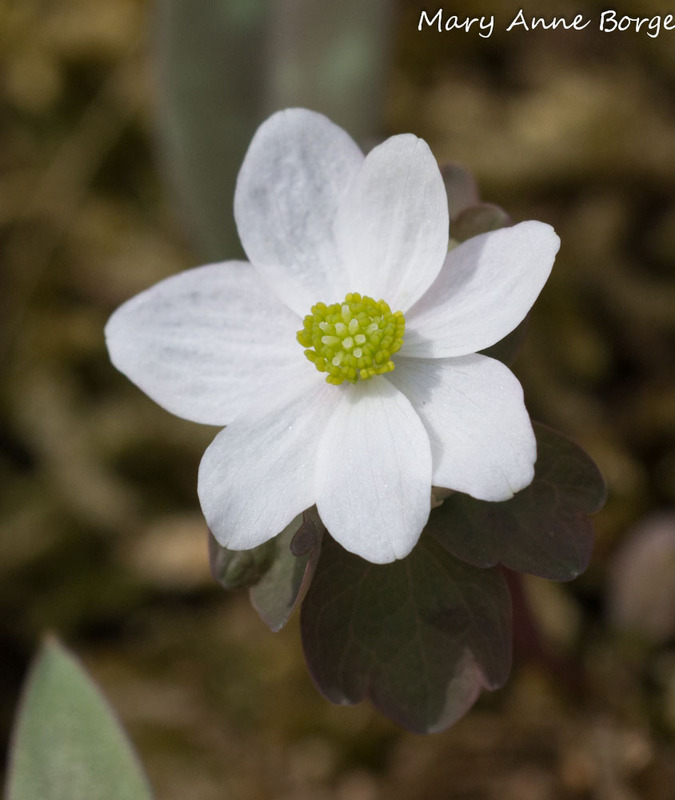 I’m learning other species may also open their anthers over a period of mutiple days. So fascinating! Always something new to learn.